Are you ready for St Patrick's Day? 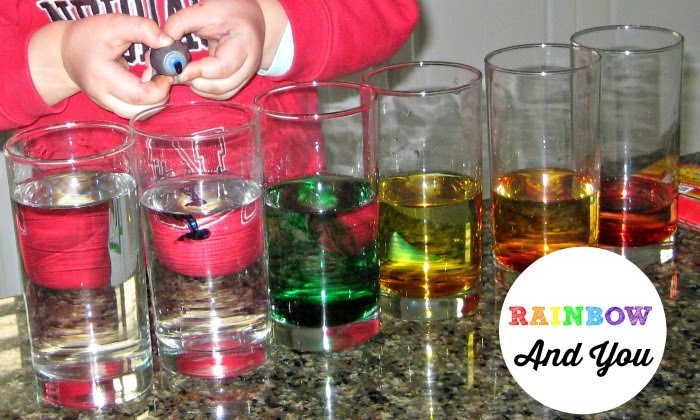 Kick off this spring holiday with rainbow activities for preschool age children! This post was refreshed in February 2014 with new graphics and links. 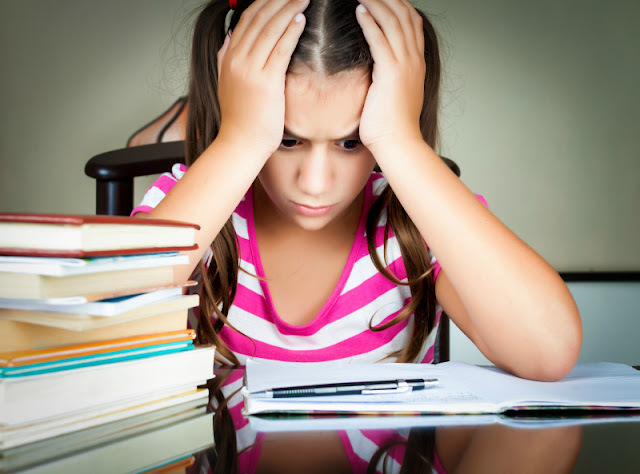 Disclosure: I am an Amazon associate and this post contains affiliate links. For full disclosure, please click here and thank you for supporting my blog! Smarty’s preschool has themes every week, so I have not done a “theme day” at home in a while even though Smarty really enjoyed them. To be honest, it’s not easy to pull them off while working full time, and daughter is usually too tired in the afternoon to really enjoy them. However, last Wednesday I decided that we would have a rainbow day (or, rather, a rainbow late afternoon) in honor of St Patrick’s Day. When I picked up Smarty from school, we started with a rainbow snack from various fruits and followed with a science experiment. I first thought of doing a density rainbow, but decided in the end to do it when Smarty is older and understands this experiment better. So we just went with a colorful rainbow xylophone. Smarty was delighted to mix food coloring and try different melodies on her xylophone, but I think we would need a taller and narrower glasses to really hear a difference in tone. It was a warm day, and we went outside to paint a rainbow heart on the paper heart dollies that were left over from Valentine’s Day. Smarty was delighted to be able to try new Crayola watercolors, and they are so much better than cheap variety. She enjoyed trying different colors on her hearts, but quickly switched to her favorite medium – stones. Eventually, she was done, and we watched Sid the Science Kid episode about rainbows. In the episode they used a prism to produce a rainbow, but we looked at the rainbow on CD surface instead. 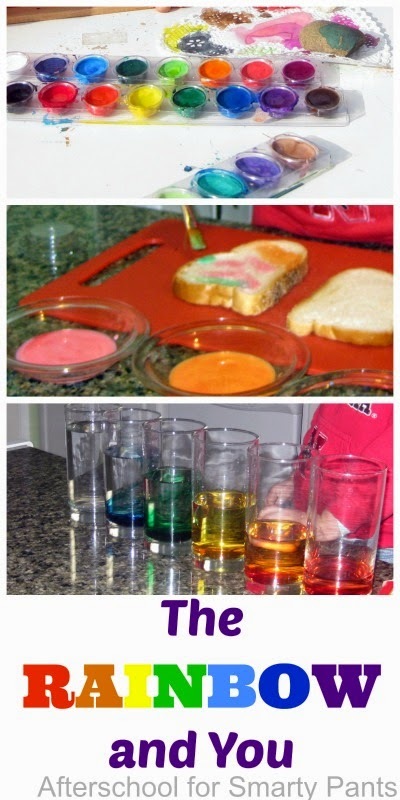 We even managed to have rainbow for dinner by making rainbow toast. Smarty was very happy to get her hands on food coloring twice in one day and whip up some edible “paint”. Suddenly plain toast was magically transformed into something more desirable, and she ate two pieces of it. Of course, the theme day would be incomplete without a book. We read The Rainbow and You by E.C. and R.R. Krupp. Illustrations worked really well for our theme day, but the story itself got a little too detailed for a 4 year old in the last third of the book. I found it interesting that both this book and Sid the Science Kid episode described a rainbow with seven colors. In many children’s books we saw rainbows with six colors, which was unusual for me, since “Russian” rainbows have 7 colors as well. Daughter chose to read the book many times since then, and I spied her writing ROY G BIV and drawing her own rainbows one day. That is a great rainbow day! I still haven't done the rainbow xylophone with C and R - I know they will love that. I'll do it soon! I love the rainbow xylophone. We sing the Roy G Biv song, but always draw our rainbows with six colors. I didn't realize there was a rainbow themed Sid the Science Kid - my girls will flip! I grew up with a seven-color rainbow - I didn't realize it wasn't the default! Crayola products are often much better quality, in my experience - it's true of their crayons over the cheaper competition as well. We should try a rainbow xylophone. We've made the colors of the rainbow before, but stopped short of the xylophone experiment. What a fun themed afternoon and yes I always thought that 7 was it for rainbows! I am with MaryAnne, I've always just thought of a rainbow having 7 colors. Selena loves that Sid episode, and she got to see the most beautiful rainbow this afternoon. It looks like it was such a fun and educational day! I love all your activities. I think it's kind of silly that we've eliminated the V from ROY G BIV. So, still use it. What a cool idea! I might have to steal it! Jane and Malcolm would love it. Fun! I love the idea of having a theme across all those different areas. This is fun Natalie! I've been wanting to do that rainbow xylophone for quite some time. I also want to make Christy's toast! Jack is my Sid Kid right now--asks for it everyday:-).